TERGO® ULS Narrow-chassis reach truck. The compact Tergo ULS is our most nimble and economical reach truck, a genuine UniCarriers in every detail. Performance, stability and reliability meet high demands and will ensure productivity and low life cycle costs. Tergo ULS is a boost for your warehousing – at exactly the right cost. The Tergo ULS is just the right universal tool for medium-intense material handling operations with loads up to 1,400 kg, and also in 24/7 operation with smart battery change technology. 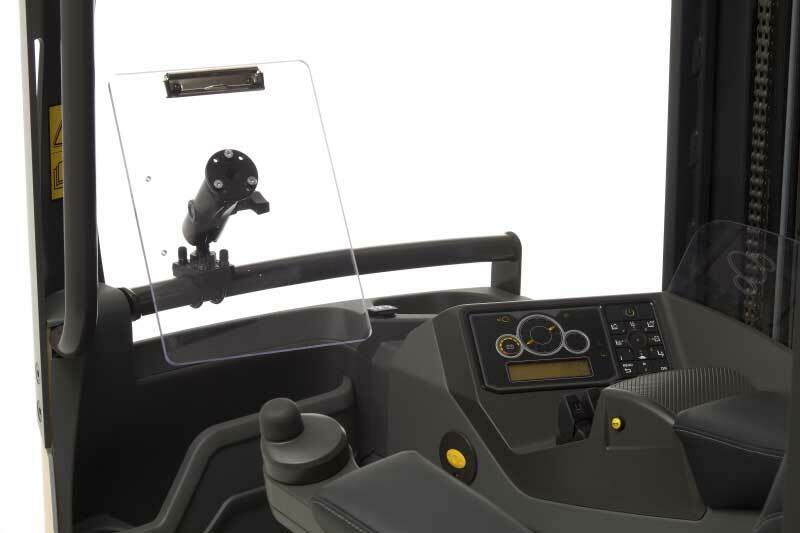 Innovative ergonomic and safety technology ensures operator efficiency in a wide range of tasks. Its supreme maneuverability and narrow chassis (1120mm width) with slim straddle legs allow room for a Euro pallet, and the integrated sideshift on the ProVision mast further facilitates material handling in confined spaces. This nimble, silent and powerful reach truck also features a superior environment for the operator. Class-leading ergonomic features, like UniCarriers' unique mini steering wheel and floating armrest, intuitive Ergologic multifunction controls and high visibility ProVision design, add to reduced operator strain and improved efficiency. A wide range of optional equipment further increases operator productivity, such as ASR (Active Spin Reduction), the S3 Stability Support System and weight indication. Naturally, traditional fingertip hydraulic levers are available as option. Are you interested in the UniCarriers ULS? Download the brochure by clicking the button below. Everything with the UniCarriers Tergo – from ergonomics to performance – is about productivity. Each of our reach trucks is filled with cost-saving, productivity-boosting technology, while also offering the highest level of safety. • High-precision mast design and a fully damped reach system with soft-stop technology contributes to supreme stability in all conditions. Mast tilt and intuitive lift controls further facilitate loading and stacking at all heights. • Mast Tilt Control (MTC) - Tergo reach trucks equipped with Mast Tilt Control experience excellent mast stability for quick pallet handling, contributing to improved stacking performance and safety. For quicker stacking and retrieval of goods, MTC reduces mast oscillation by up to 80% on trucks with Mast Tilt. • Dynamic Cornering Control (DCC) - This ensures save driving and the hands-free direction control uses the accelerator for change of travel direction allowing the operator to use the right hand to operate up to three hydraulic functions simultaneously. • The energy efficient and powerful 48V AC motor provides excellent performance, offering a top speed of 12.5 kph (optionally 14.5 kph on the UMS and UHD). 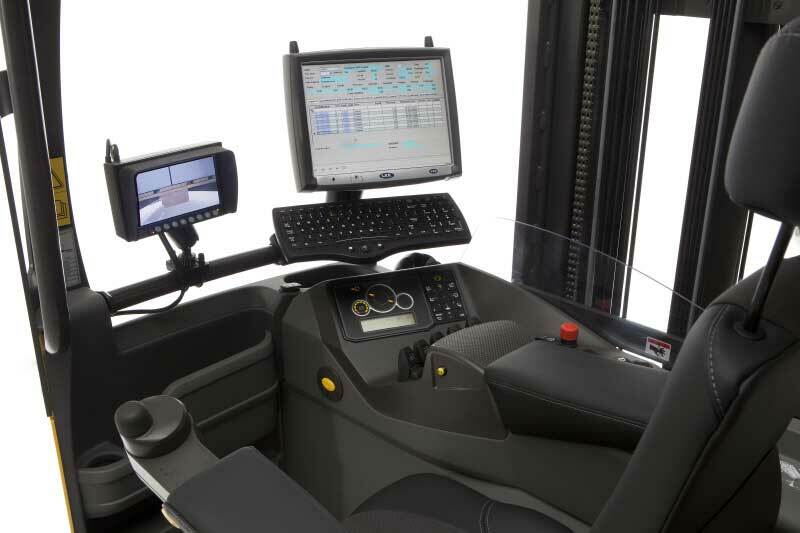 To maximise productivity and safety, the UniCarriers ATC 3 truck computer, with personal PIN codes for individual performance settings, allows the reach truck to suit each operator's driving skills. Up to 250 different drivers can individually adjust the performance and personal settings, including preferred acceleration, braking, and steering types - either 180 or 360 degrees. UniCarriers Tergo reach truck series is designed with focus on long service intervals and excellent serviceability. The unique UniCarriers Truck Computer (ATC3) with CAN Bus technology allows the service engineer to easily and quickly diagnose and service the truck, thus keeping uptime to a maximum. All UniCarriers trucks are designed according to UniCarriers's unique Modular Design Concept which improves quality and limits the number of parts used. Our mobile service engineers therefore only have to carry a limited number of spare parts which contributes to providing a First Visit Fix Rate (FVFR) of over 95%, resulting in market-leading uptime. The UniCarriers Tergo range is all about you and your operations. Everything from design, technology and performance, to service and financing has been created to fulfil the needs and wants of the world's most demanding truck users in the most personal way. All because we know that technology designed around human needs makes people more productive and happy at work. And to make your UniCarriers Tergo even more you, there’s a wide range of specially designed options and accessories. The UniCarriers S3 - Stability Support System (optional on the ULS) provides technology which ensures an unmatched industry-leading safety level. To maintain driving stability in a wide range of situations, the S3 technology continuously measures speed, steering, commands, mast movement and lift height of the truck. The S3 - Soft Motion system further improves handling speed while stacking, by continuously adjusting reach, tilt and sideshift speed based on an advanced algorithm. The system reduces mast oscillation to a minimum, allowing maximum performance in every single moment. DCC (Dynamic Cornering Control) modifies the relationship between the speed of the truck and the operator's steering wheel movements, allowing a higher level of cornering speed. When handling loads at high levels, the S3 - Soft Motion adapts the tilt and reach speed to maximise stability and safety. Tergo trucks can also be the perfect solution for cold store applications down to -35°C, especially with the optional heated cabin. The innovative LAS (Level Assistance System) feature is moving intuitive material handling to a new level. The technology automatically detects the operator's intention, and stops the forks automatically and with full precision at the right level. The ASR (Active Spin Reduction) also works to improve safety, especially when driving on surfaces with low friction, and reduces drive wheel wear for additional cost savings. The spacious cabin is entirely designed around the operator. The unique mini steering wheel and floating armrest allow effortless manoeuvring during long shifts with a minimum strain on arm, neck and shoulders. The seat and the armrests are easily adjusted to the individual operator – up to seven different parameters can be set. The ProVision mast design further enhances visibility and ergonomics when handling high loads. The separate footstep and a specially designed instep handle make it easy to get in and out of the truck. Make yourself comfortable. We’ve done everything to make your new workplace a joy to work in. Take a look and get acquainted.